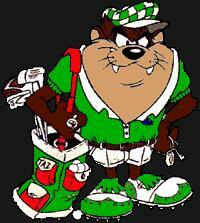 Welcome to the G.S.C.I'm your host.My name is Taz. As you can see,everything in here is aged.Ok,go ahead and shoot me for being away for four months and missing all the action! The last preparatory game for Greece was a winner as the players of Panayiotis Giannakis won Poland with a score of 103-73.The best player of the greek team who is setting up for the big one,was the chief,Fanis Christodoulou who scored 17 points.The game was held on spanish grounds. The team did it again.Having a lead all the way through,Greece beat Russia and conquered the first place in the 1st group.Keeping the distance even up to 18 points in the first half,Greece almost destroyed everything in the second half,as the russians made a derby out of the game.Keeping calm,the greeks managed to keep the win,with four players passing the ten points limit.Oikonomou and Rentzias both had 16pt,followed by Koronios and Christodoulou.Tomorrow's game with Bosnia shouldn't be a problem at all for the players of Panayiotis Giannakis,as the Turks beat them today quite easily. Greece beat Bosnia in a thriller,after a buzzer beater three-pointer by Frangiskos Alvertis.The greeks underestimated the bosnians,and,whilst in the lead during the first half with up to 18 points,turned to get behind in score with even 9 points.Young Papanikolaou took it up by himself and gave valuable help in offense.With a good defense,and the score being 75-76 for the bosnians,the greeks got the ball and made it to the last three pointer with Alvertis.The top player of the team,who was really disappointing,was Papanikolaou with 20 points.Now Greece is facing Lithuania on Sunday,in an attempt to conquer first place in the 1st group of the second round. Sorry for the delay folks.Eurobasket is over.Greece got the fourth place with the "Plavi" getting the first after beating them in the semi finals. In my opinion,it was an unworthy defeat.I'm too sad to say anything. History from thrylos should David Rivers be considered since his answer was delayed beyond limits.Dusan Ivkovic is now looking in the Russian market for a playmaker.Karasev and Bazarevic are first in the list,with the serb Dejan Bondiroga to follow. -Comment:Let's hope that Olympiakos is not going to dismantle the Euroleage winning team.George Sigalas and Christian Velp have already left and so is David Rivers.Ivkovic should be aware that this is a Greek team and should not be filled with serbs and other Europeans.Panathinaikos,is a recent sad example of such a behaviour.